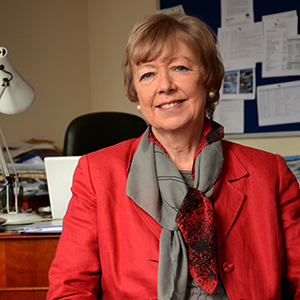 The University of Liverpool’s Blair Chair, Professor Marianne Elliott retires after more than 40 years at the forefront of researching Irish history, and pioneering the pursuit of Irish Studies in the UK. 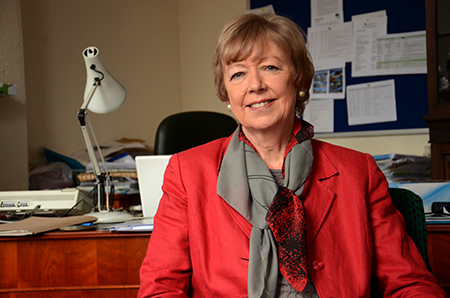 Already an internationally renowned scholar, Professor Elliott took up her role after being asked by the then British government to produce three reports into Irish Studies in the UK. This led to the decision to establish an Institute of Irish Studies at a major British university, and the University of Liverpool was chosen. Professor Elliott said: “My most important legacy is the international reputation the Institute has now. “For the last 30 years of my life I have been missionary about Irish Studies in this country, about raising the standards and the profile. “When you are developing new things – and I learnt this during the peace process – you have to have a lot of patience. You need never to give up. The Institute is now a regular stopping off point for dignitaries from all levels of Irish politics and public life and hosts high profile events. It also features heavyweights such as BBC foreign correspondent, Fergal Keane, and the UK’s principal negotiator in the Irish peace process, Jonathan Powell, as Visiting Professors. Arriving as a young student in the early 1970s from “war-torn Belfast”, Professor Elliott says she was struck by the tolerance of the British and was “aghast” at the IRA “carrying out terrible atrocities over here, supposedly in our name”. But she says she was always aware of the British stereotype attributed to the Irish as “a peasant, a bit thick” and that this, along with being a woman in a male-dominated academic world, motivated her to achieve. Professor Elliott said: “I always knew I had to be better than other people in the field because, underneath, whatever the welcome, some of the stereotype would still come out. “You don’t find them so much anymore, and I watched that happen. “Ending the Troubles helped a lot and I’m proud about that because I certainly was involved from the early stages, setting up various education research groups in Britain. Another indication of how much has changed over the last 30 years, says Professor Elliott, is the number of Irish entrepreneurs “full of confidence in this country, contributing a lot and being well-respected”, something she says fills her with pride. But, remembering the difficulties of those early years could provide a new path, as retirement frees up time to focus on new challenges. Professor Elliott said: “A lot of the stereotyping that is going on with immigrants really bothers me, because, of course, the Irish were on the receiving end of it. Professor Elliott will retain a role at the University as an Emeritus and Honorary Professor.